By recycling over 180,000 tons of concrete and asphalt, we are able to reuse materials that would otherwise add to the growing burden on Oahu’s landfills. We are constantly seeking ways to improve our processes, reduce waste, and protect our island home. For more than 75 years, Grace Pacific LLC has been a driving force in Hawaii’s growth and prosperity. Grace Pacific does more than just build roads. We offer a wide range of construction-related materials and services. In 2006, Grace Pacific Precast, Inc. and Rocky Mountain Prestress merged to form GPRM Prestress, LLC. This partnership allowed the two companies to combine their strengths and abilities to provide the best product and service to the Hawaii construction market. We are Hawaii’s largest asphalt paving contractor with operations on Oahu, Hawaii, Maui & Kauai. We have used our expertise since the 1930’s to enhance airport runways and taxiways, harbor wharves and container yards, interstate freeways, highways, bridges, roadways, bike paths, tennis courts, driveways, and parking lots throughout our state. We are one of the very few paving contractors that are able to do state highway jobs with their rigorous requirements and large scope of work. We have acquired different companies and expanded our services to help us become Hawaii’s foremost leader on paving. We now have quarries where we mine the aggregate; plants where we mix the asphalt, concrete precast plants to help build bridges and buildings; construction company to install the guardrails & signs along highways, and able to apply protective coating to the asphalt to extend the useable life. As a company, we are always looking for ways to improve to better serve you, our customer. With the new year right around the corner, Grace Pacific will be implementing new changes for the Makakilo Quarry location. We are asking that you, our customers, give us at least one business days notice BEFORE picking up or bringing in materials. Starting January 1, 2019 priority will be given to company’s who have given us this prior notice. Those who call or email to place an order on the dayof, will not be guaranteed product pickup that day. This is to help insure that the quarry can meet all our customers’ needs and to minimize slowdowns and confusion at the scale which could lead to errors in orders. When placing an order, that person must have authorization by the company purchasing the material. If drivers attempt to pick-up the day of and have not been given pre-authorization, they will be asked to pull off the scale and have an authorized person from the purchasing company notify us of the order. 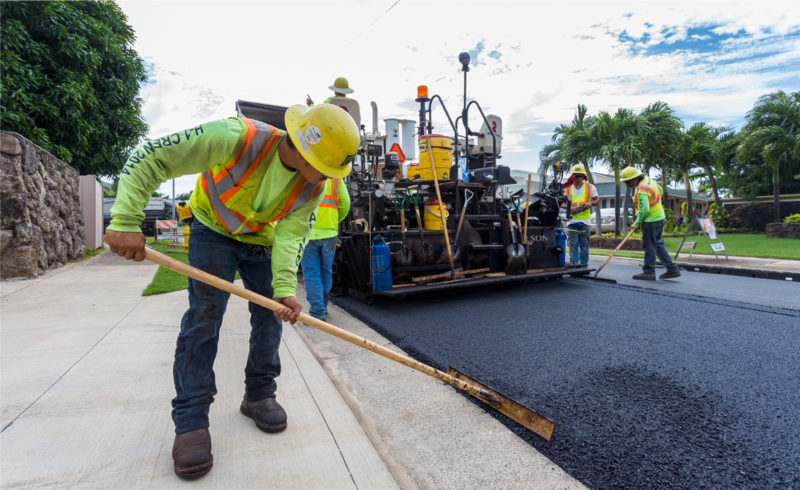 With a highly skilled team using the most advanced technology in the industry, Grace Pacific produces award-winning paving projects and sets the standard for Hawaii. As Hawaii’s largest paving contractor, we have used our expertise to enhance airport runways and taxiways, harbor wharves and container yards, interstate freeways, highways, bridges, roadways, bike paths, tennis courts, and more. We can provide the right construction aggregate for whatever your needs are, from batching ready mix concrete or hot mix asphalt, to base course for foundations, backfill for trenching, general fill material, and even cinder for your little league's baseball infield. The key to our successful quarry operation is our ability to consistently provide quality aggregate to meet market demand. Our subsidiary, G P Roadway Solutions Inc. offers a full line of guardrail blocks, posts, custom bridge rail and accessories including W-Beam, Thrie Beam and Box Beam sections. Our supplier provides us with an Engineering Department that is equipped with state of the art CAD equipment to efficiently and professionally layout any custom guardrail or bridge rail project. Grace Pacific is also a leader in construction and maintenance services in Hawaii. G P Maintenance Solutions was formed in 2002 in response to the discovery of a new product: MicroGuard, which mitigates corrosion and mold.Our construction and maintenance services help keep Hawaii's projects strong for many years. Grace Pacific does more than just build roads. We offer a wide range of construction-related materials and services.